Well done to all who complete the various races this weekend. We had members competing the Debra Ireland Half Marathon, the Garristown 10K and the Meath Half Marathon & 5K races! The F4L group continues to go from strength to strength and again there was a decent Ratoath AC contingent taking part in the 5K, Una Simpson was first Ratoath lady home in 21.57 and was followed shortly after with another PB by Claire Witter 24.31, Jacinta Forde 25.18, Bernie Roche on her first 5K posted a very respectable 25.34, followed by Kate O'Driscoll 26.26 and the ever improving Joy Tyrrell 30.03. Great work ladies keep up the good work and we are sure those times will be beaten next time out. A picture paints a thousand words and this was certainly the case at the at the end of the Bohermeen (Meath) Half marathon on Sunday, 8 members took part and for many it was their maiden voyage over the distance. The smiles as they crossed the finish line said it all. This group has been working very hard over the last number of weeks, months and have been spotted pounding the highways and byways around Ratoath every Saturday morning in their quest to complete this event. The Ratoath contingent were led home by Michael Kennedy in a time of 1.33.54 and was followed home by Damian Ryan 1:50:15, Alan Donnelly 1:50:34, Jaralath Nally 1:52:31, Monica Reilly 1:58:37, Melissa Dunne 2:00:28, John Coroner 2:02:19 & with only a handful of runs under his belt Hugh Kelly in 2:04:05. Fantastic running and some super times guys, keep up the good work. Following their success in Bohermeen Jaralath & Hugh are now looking for like-minded individuals to join them in their quest of completing the Dublin City Marathon in October. Ratoath AC also provided the Half Marathon with pacers, Keith paced the 1.45:00 group and got round in 1:45:02 whilst the lively Eimear Griffin & Karen Kirrane brought a touch of mardi gras and fun to the event as they guided the 2:15:00 group round in 2:14:30. Great job guys. Those in the Pic include (from Left to Right): Melissa Dunne, Michael Kennedy, Damian Ryan, Jaralath Nally, Hugh Kelly, John Coroner, Alan Donnelly, Eimear Griffin, Karen Kirrane, Kate O'Driscoll, Claire Witter, Bernie Roche, Joy Tyrrell & David Tyrrell. 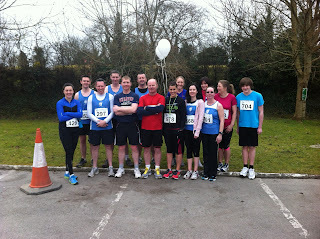 Many thanks to Bohermeen AC for a great event and post-race refreshments.